Have you ever heard the Cretaceous Era? Yep, that was where the dinosaurs dominated the Earth. Where most dinosaurs develop and one of the most exciting era ever. The era was the best time in Dinosaurs history. 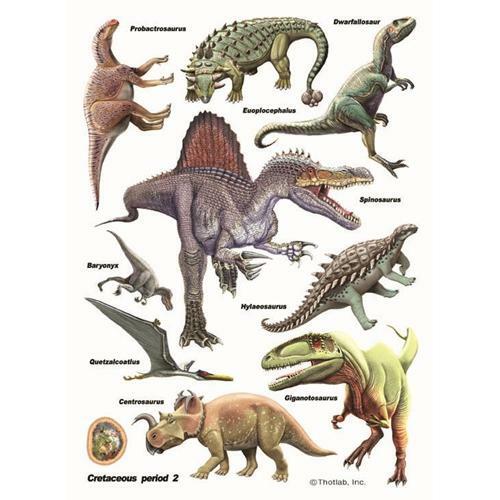 Though dinosaurs ruled the Cretaceous, the dominant groups start developing and many new types evolved. Iguanodon spread all over the world, except Antartica, Sauropods rules the southern continents and almost rare in the north. The Triceratops munched cycads and other bushes or low-lying plants on the Northern Continent. The boss, Tyrannosaurus Rex dominated the North continent, in other side, one of the biggest dinosaurs, the meat-eaters Dinosaurs, Spinosaurus dominated the Southern Continent. Not only dinosaurs, other creatures like crocodiles, snakes and crocodiles also spread all over the world. The Ancestors of sandpipers and pelicans, they all show up in the Cretaceous Era. In the sea, Plesiosaurus rules the underwater life. There are also sharks, starfish. The coral reefs is growing at this time. Now, I’ll list the Creteaceous Dinosaurs for you. All above are the list of Herbivores Dinosaurs. I’m sure that most of you know those Dinosaurs. This time was the time for T-Rex To Rules and Bosses the World. Cretaceous era was the period when T-Rex lived. Not only T-Rex, another monster dinosaur like Spinosaurus also lived in this Era. Imagine if you lived at that time, you’ll be amazed! Here are the list of Carnivores Dinosaurs in Cretaceous Era, I list it in Alphabetical order. 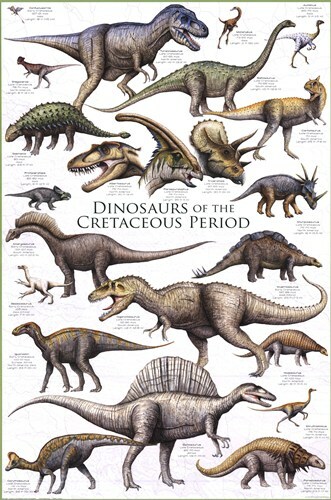 There are some information about Dinosaurs who lived in Cretaceous Era. Feel free to spread this information to your kids, friend or colleagues. You are free to use any information from this site. Please provide Dinoleaks as the source.